Welcome to cutieerica.com! | Art, Design, Life. Welcome to cutieerica.com! This is my website that will be featuring many of my art layouts, doll customizations and photography. 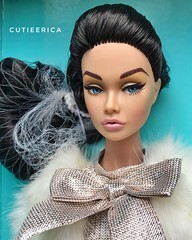 I really enjoy customizing Fashion Royalty and Barbie dolls to have a new and unique personality. One of my specialties is re-rooting dolls. My commission book is currently CLOSED.